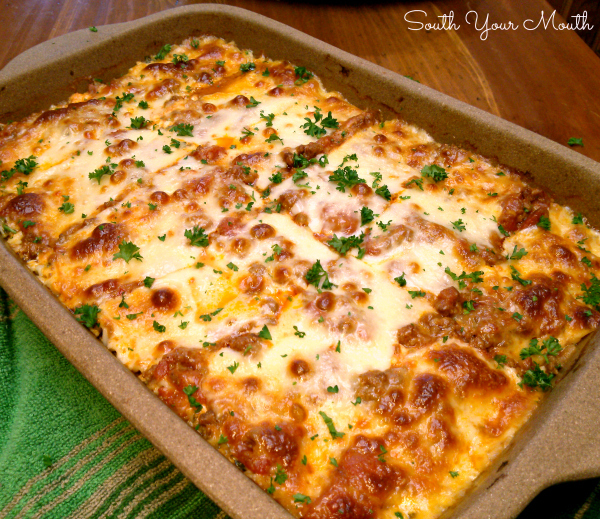 An easy recipe for classic lasagna using prepared sauce and traditional ingredients. Here’s my version of a classic lasagna! And my thoughts about some of the alternatives to making it. I’m sure I’m going to start a riot with this but here’s my two-cents on a few things to do with lasagna making. I don’t think you have to make your own sauce. I know it’s amazing when you do but my thought about it is that there are so many other flavors and textures happening with lasagna that it’s really not necessary. I actually prefer cottage cheese over ricotta. I know ricotta is more authentic and your Italian grandmother would probably bungee jump naked before she'd use cottage cheese but I think you lose the ricotta in lasagna because the texture is so fine. And sometimes it almost comes across mealy. I like cottage cheese because I think it stands up to the other ingredients but, by all means, use whichever you prefer! Shred your own or buy pre-shredded cheese? The only thing I am a snob about with lasagna is the mozzarella. Do not (repeat: do not!) buy shredded mozzarella. Shredded mozzarella is finished firmer to make it easier to shred so it's not as creamy and looses its elasticity. And shredded cheese is coated with all sorts of additives to prevent it from sticking together (like powdered cellulose… which is basically chemically treated wood pulp… ummm… yeah… NO). Between all the additives and firmer finish, the cheese doesn't melt right or taste as good. I think you can use traditional cooked noodles or buy the no-boil kind but if you’re using the no-boil kind, add about 3-4 tablespoons of water to your meat sauce and maybe even a tablespoon of milk to your cheese mixture. The no-boil noodles will leach the liquid they need from your other ingredients so your lasagna might be dry if you don’t juice it up a little. You may also have to cook it longer to get the noodles tender. So anyway, here’s how I make mine and I absolutely love it! This is just your basic, classic lasagna with meat sauce and cheese. Feel free to jazz it up with veggies and fresh herbs! Brown ground beef with onion and salt and pepper in a large skillet until meat is cooked through; drain fat from meat. Add spaghetti sauce and crushed red pepper then stir to combine. Reduce heat to low, cover and simmer meat sauce for 30 minutes. Combine cottage or ricotta cheese, 1/2 cup parmesan cheese, egg, parsley, oregano, garlic and salt; stir to combine then set aside. Divide cheese in half. Shred one half and slice the other half into thin slices. I like to slice my mozzarella into thin slices using a wire cheese slicer (you can see the slices on top of the lasagna in the photo). If you don’t have something to easily cut thin slices with, just shred all of your mozzarella. You will use 1/4 of the cheese in the first layer, 1/4 in the second layer and then use the remaining half on top. Cook lasagna noodles in liberally salted water per manufacturer’s instructions for al dente preparation. Drizzle the bottom of a large rectangular baking pan with olive oil. Arrange 3-4 noodles (depending how big your pan is – mine fits 3 noodles per layer) in a single layer in baking pan. Spread 1/3 of the cheese mixture over noodles. Top cheese mixture with 1/3 meat sauce. Top meat sauce with 1/4 of the mozzarella cheese. Repeat these layers two times, adding remaining mozzarella and remaining 1/4 cup parmesan cheese to the top. Cover dish with aluminum foil then bake at 350 degrees for 35-40 minutes or until bubbly. Remove aluminum foil from dish and continue baking for 15-20 minutes or until cheese is nicely browned. Remove from oven and let stand 15-20 minutes before serving. Garnish with fresh chopped parsley if desired. I like cottage cheese over ricotta, too. This looks delicious! I recently made a huge batch of bolognese sauce and froze part of it to make lasagna at a later time. Having seen this recipe, seems like now would be a good time to thaw it out! This truly looks amazing. I agree with every point you made, particularly not using pre-grated cheese! Once I learned and came to appreciate the differences, I will never buy pre-grated cheese of any kind for any reason, ever again. I am always glad to see others spread the word to stop the pre-grated madness! Its the worst injustice you can do to any recipe. And it's so much cheaper too! I usually buy a huge block of cheddar and shred it as I need it. It keeps forever and you can just trim off any yucky bits if it starts to age too much - what's inside is still perfectly fine. Hi Mandy!! I can be your 100% Italian - born there - and I can say that I agree with you on your whole list. And yes we've found a brand of sauce that we LOVE. We wait until it goes BOGO cuz it is pricey but right now we have 48 jars. We do share with our kids. And up north - the Costco and Sam - they do not sell the big horn of mozzarella cheese. They sell the shredded - Yuck!! Out of desperation we bought some and it was terrible. I thought it was our milk carton shredded. Down South - we're visiting - they do have the large solid block of cheese. Yay for the South!! We will be sure to purchase our cheese before we go back in the spring. Love all the points you made! And I love cottage cheese in my lasagna. To be honest, I think that is all I've ever had! LOL! And your lasagna looks absolutely smashing! Yummers! Yippee!! I am so very excited for you and for me as I'm addicted to the Food Network. But seriously, there are so many food blogs out there that have recipes that either taste terrible or just plain don't turn out. I can always count on yours tasting so yummy and are easy to make. You deserve this!! Well, in my excitement I posted on the wrong page. My comment still stands but I must post that I made this lasagna last night and it is now my hubby's new fav! My man is having a rough week, and is about ready to snap with all the snow. He couldn't even get the rig back into the yard today for all the snow. So, that meant lasagna for dinner. I had read this post before, and read your ingredients and thought it was similar enough to what I usually throw together I didn't pin it. Shame on me! I came here tonight to get your recipe just to try it, and OMG girl, this recipe rocks! Yes, relatively same ingredients I use, but you put it all together different. LOVED it! 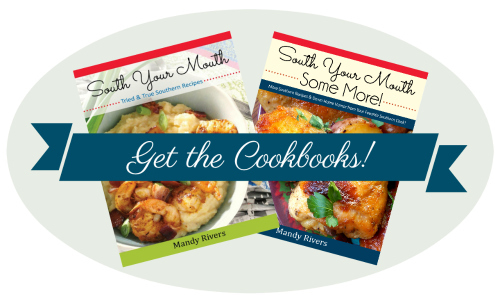 Another keeper and really hoping for your cookbook to be in the works some day soon! Made this today for the family who came to say goodbye to their grandma who is heading back east after a visit with us. 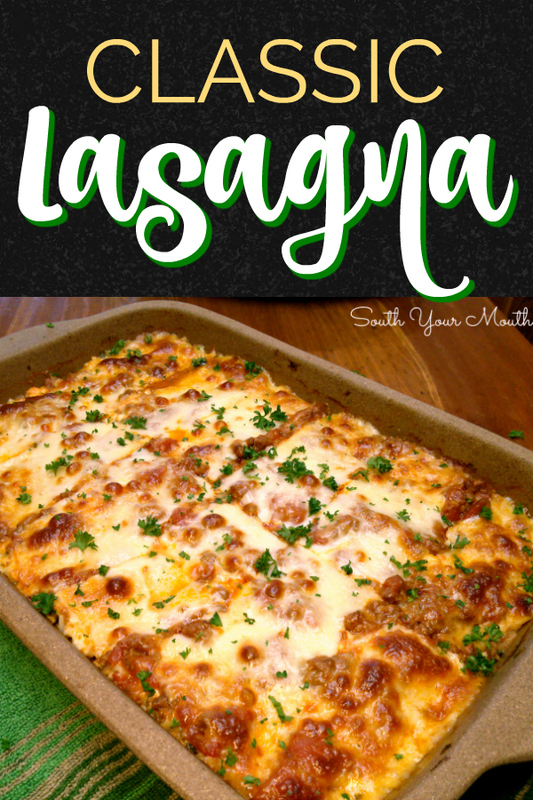 This is now my go to recipe for lasagna, Figured my husband and I would have leftovers tomorrow however must go to plan B as there are no leftovers. Thank you so much for a wonderful recipe. This is a perfect lasagna recipe. I add small dots of cream cheese to each layer, adds a little extra creaminess. And I always make two and freeze the other. Thanks for a great recipe! I'm a ricotta purest, I grew up on it, so i enjoy and expect the subtle grainyness. I find the smoothness of cottage cheese disturbing and alien in baked applications. Everything else about this article is on the money though. Since it is so damp and rainy today, this will make for a perfect evening. ricotta only! I travel back to the Chicagoland area & buy fresh ricotta at an Italian deli. It is NOTHING like the whipped smooth junk they sell in the dairy dept. I buy in bulk & make two trays of lasagna & some stuffed shells. What is the best kind of spaghetti sauce to use? Awesome recipe. Already a family favorite! YOU NEED TO BE ON FOOD NETWORK!! Admittedly, I'm remiss to comment, good or bad, on recipes that I use. However, I come back to this recipe on a regular basis because my husband, especially, is obsessed with it. I do a handful of small amateur tweaks, including adding cream cheese to the cheese mixture to provide a little bit of creamy texture. I'm also a fan of using the cottage cheese (my husband has NEVER been able to tell, and he hates cottage cheese)! Thank you for sharing it, and for all your awesome recipes! I'm so glad y'all enjoy it! This may be a silly question but when adding the mozzarella,do you a the slices and shredded both at the same time? Or you save the slices for the top? This is crazy! I can't Pin because it says it will lead to spam! Looks good. I'm cooking my way through your first cookbook and finally made this lasagna. Why did I wait so long?! I used the no-boil noodles and added a little extra sauce. Two thumbs up from the man himself!